If you’re a parent and you’ve been to a bookstore lately, you might have noticed a growing trend in issue oriented books for children. These are books that address topics such as global warming, poverty, and food sustainability. Mary Ito looked at what’s behind this trend with Dory Cerny, Books for Young People Editor at Quill and Quire. A Good Trade by Alma Fullerton, illustrated by Karen Patkau (Pajama Press, ages 5+). – In this book, a young Ugandan boy embarks, barefoot, on a lengthy journey to get water from the pump located outside of his village. When he receives an unexpected gift from an aid worker who has come to the village square, he devises a meaningful way to say thank you. The message here is clear, but delivered with a soft touch, reminding young readers that not everyone is as fortunate as they are. This is a simple little biography/history. 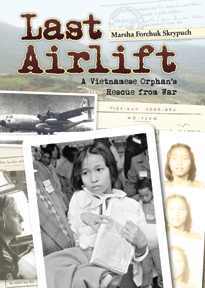 It’s the story of a Vietnamese girl, one of the last to be rescued as the North Vietnamese army marched into Saigon. It’s easy enough for a younger reader to understand and while it doesn’t soften the harsh realities, there’s nothing too graphic. It focuses mostly on Tuyet’s emotions and adjustment to living in Canada with a family. A Bear in War gently introduces young children to war. This true story about Lawrence Browning Rogers’ life is told from Teddy’s perspective. The innocence of Teddy’s voice is deeply comforting and will resonate with its young audience. Co-authors Innes and Endrulat do not shield the reader from the sadness war brings but choose to demonstrate it with tremendous sensitivity. Deines’ exquisite oil paintings beautifully couple the innocence and sensitivity that Innes and Endrulat create. Each illustration is soft in its rendering and also expresses a depth of emotion that moves the reader. Simply put, A Bear in War is a story that parents must read to their children. —Inderjit Deogun is a poet in Toronto, ON.